Please note there are several unrecognized trails within this area that are commonly referred to as Finding Neo, Sidewinder, Spicolli etc. (I mention these only for location reference purposes). This has been a culmination of work from several partners including SDMBA since 2008. We thank all partners involved in the area and look forward to further partnerships. Construction work is scheduled to begin in the upcoming months on the Anderson Truck Trail (ATT) which was identified for decommissioning in 2008. The project will rehabilitate old roads and parking areas on NFS lands. In the years since, SDMBA has been working with a coalition of adjacent land managers and local jurisdictions to secure legal public access to the Forest Service parcel containing several popular non-system trails. Although legal access is still pending, the Forest has modified their order to decommission Anderson Truck Trail (the road that runs south to north and east to west) and instead will replace the existing road with a single-track trail. 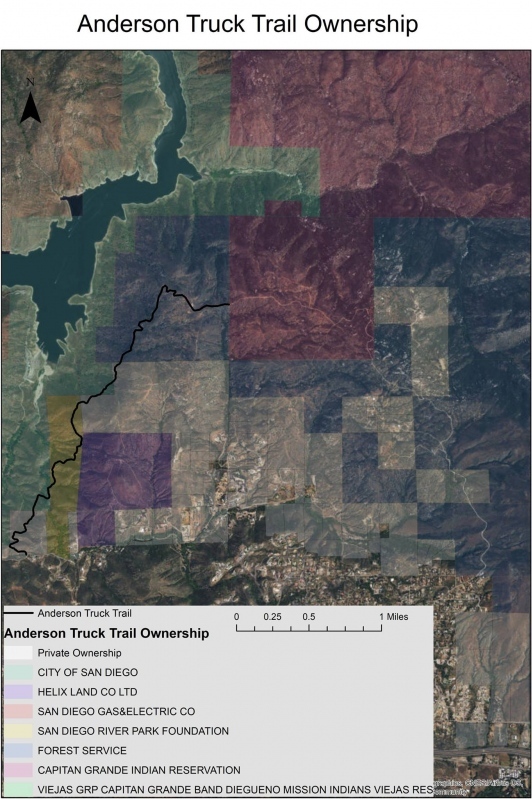 Contractors will begin work in the upcoming months on National Forest Service land to construct a single track trail along historical Anderson Truck Trail within the decommissioning project. The road-to-trail conversion project will utilize excavation equipment to narrow the corridor into a single track, while the large parking areas and other unauthorized roads at the top will be rehabilitated to its natural habitat. Currently, there is no legal way to access the NFS trails without trespassing on private property. SDMBA is aware that the public has historically accessed these trails through unauthorized means. Please respect the ownership east of this area and avoid trespassing on the El Capitan Reservation. The trail commonly referred to as “World Cup” crosses onto Tribal lands and in past instances, has extensively damaged cultural and natural resources. In response, the Tribe has added gates and several miles of fencing along their property boundary to block the public from accessing and damaging this area. SDMBA respects Tribal land rights and discourages the public from trespassing. Once legal access is acquired to NFS lands, the San Diego Mountain Bike Association in coordination with the Descanso Ranger District on the Cleveland National Forest is proposing trail improvements, reroutes, reconditioning and new development in the future." We will continue to notify the public with any updates.